Evolution Motorsports Head Gaskets were developed to handle increased cylinder pressures and more extreme boost conditions and heat. A typical OEM head gasket failure typically only occurs under extreme conditions however, we have seen some higher mileage engines with signs of head gasket seepage which is usually the first signs of eminent failure. This failure is due to inadequate head torque provided by OEM head studs as well as head gasket fatigue. 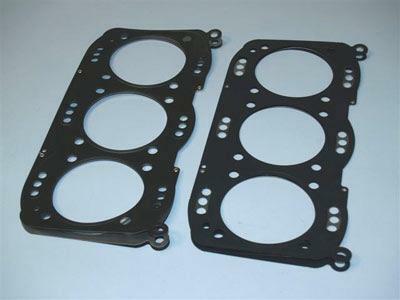 The OEM head gasket is a 3 layer stainless gasket that is a good design however, our similarly designed 3 layer design offers benefits well beyond the OEM gasket. The outer layers of the Evolution Motorsports Head Gaskets are embossed and coated on both sides with a flouroelastomer rubber based material (Viton) which is designed to meet the demands of a variety of harsh sealing environments, load conditions and surface finishes. The Viton coating is heat resistant to 250 C or 482 F. The center shim layer is a uncoated stainless steel layer which is nearly 5 times stronger than the OEM center stainless layer. This is a key element to our gasket design which will prevent the typical blow out of the center layer of the OEM gasket. Our head gasket design promotes an even torque load across the sealing surface allowing for measurable reduced bore dissertation and a stronger seal between the head and cylinder.